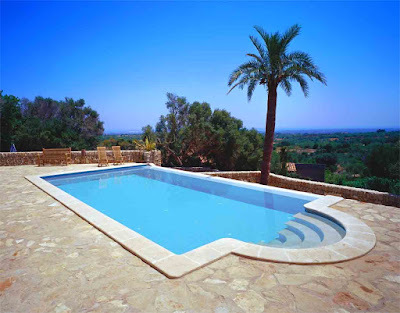 When I asked for some blog topics you guys would like to see, I got a lot of requests about the pool. How do I take three kids to the pool? What do I take to the pool? How do I watch all my kids at the pool? Today, we're talking THE POOL, which is one of my favorite things. 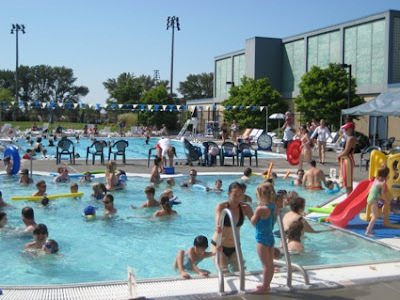 If you've been reading here during the summer months then you know my people enjoy the pool as well. In the summer if you're looking for us and we aren't home, you should check the pool. It looks pretty easy to keep on eye on all the kids at this one. hahaha! Right? Or maybe that's just how it FEELS when you're taking kids to the pool solo. 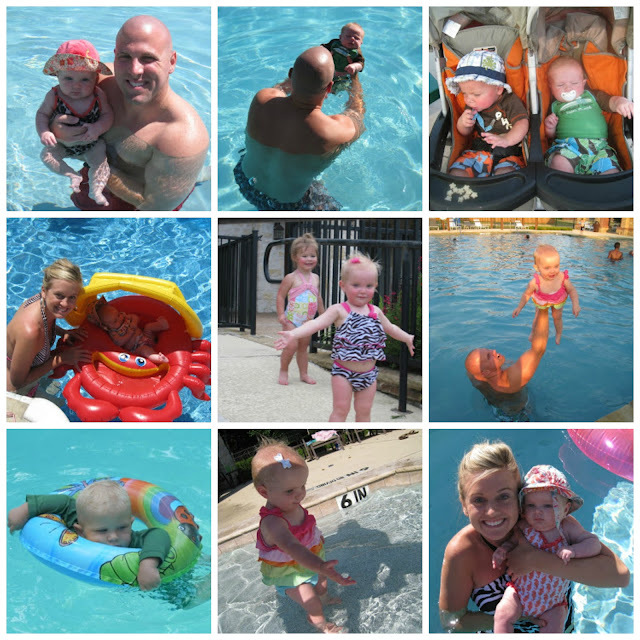 We've been taking our kiddos to the pool since they were babies. I should add that I'm trying to speak to all the Mamas about how I take kiddos solo to the pool, but all my pictures are including Tab! The reason is-when I was solo at the pool-picture taking just wasn't happening. When Ebby Lee and Nixon were both little, the pool was hard but that was not gonna stop us from getting out. I ALWAYS went with friends. Granted, my friends had babies too but we always kept all our eyes on our little people. An extra set of eyes was huge! I found a flotation device that worked. Don't let that picture of Nixon with that little floatie ring fool you, that was not the kind of flotation device I'd use if I was solo at the pool. On this particular day, we'd forgotten his floaties so he was using what was available and there were tons of adults present. When my kids were younger, they used floaties. I think at the time puddle jumpers were to new? I don't know. I don't remember them at the time. Those floaties with the soft material on the outside (not the hard plastic) were our go-tos. Two summers in a row (when Nixon was one and two) Nixon had NO fear of the water. I'm talking jump right into the water and wait for someone to save him. He'd come up smiling. I threw my pride out the door and got him one of these full on life-jacket body suits. Did he look super cool? haha! NO! But I felt so much better knowing he was wearing this when we went to the pool. I took my kids to swim lessons at an early age. Starting at the age of two, my kids have gone to swim lessons with Mrs. Sally. She's tough. She made them get their eyes wet way back when they didn't want to, but now I have her to thank for my two big kids who are great swimmers. We found the right pool. As crazy as that sounds, there are lots of pools in Texas. My girlfriends and I found a pool that worked for our children's ages. When they were younger, we always hung out at this kiddie pool that had a big covered area, was super shallow, and fenced in. It was the perfect place for us to be! Mind you...if we had a dollar for every time someone had to save Nixon in that little baby pool none of us would ever have to work again. My girlfriends can tell you...he was CRAZY! We make GREAT memories. Sometimes my kids are swimming with friends. Sometimes Tab and I are challenging them to cannonball contests. No matter what we're doing, I can guarantee we're making good memories at the pool. I got really laid-back with that third kid. Can you tell? With Ebby Lee, I would have left the pool immediately if she needed to nap. Not with that third kid! I wanted my big kids to get to swim and have fun so I quickly realized if Bowen was tired and needed to nap-we could make it happen at the pool! Bonus...it was WAY easier for me to keep up with the other two if the baby was asleep. I remember Bowen falling asleep on a pool chair and my friends helping me pick up the entire chair (with Bowen on it) to put him in the shade. #truefriendship If you have older kids and are stressed about how you'll make the pool happen this summer, try to be laid back with that baby's naps. We spend a lot of time in the pool. This has helped my kids become good swimmers at a young age and it's helped them be comfortable around the water. I've always done what feels right. For instance, Nixon could "swim" but I made him wear his floaties all summer long while I took him to the pool solo (without Tab). Bowen is doing great so far at swim lessons this week, but no doubt-he'll wear his puddle jumper for most of the summer when he's at the pool with me. It just makes my mama heart feel better knowing they're all safe. I hope this post helped you guys that had lots of questions. If you have a more specific question, please comment and I'll do my best to answer. Thank you! Oh my goodness! So much to say!! First of all, I'm coming back to read Sheaffer's comment because I know it's going to by hysterical. I just know it :). Second of all, when I'm old and grey THESE SUMMERS will be some of my very fondest memories. Looking back at the pictures fills my heart with so much joy because these are truly the best days of our lives. Love our summers together and super pumped that it all starts again in just a few days! Woohoo! I know, girl!! And I cannot wait! :). Your kids are going to appreciate all of the memories you make with them in the summer! And especially being so present in their lives! My mom is a teacher, so of course she had the same schedule as we did. I am so appreciative that she was so present in our lives and did things just so we could create memories and have fun together! My mom was a teacher too and I completely agree. Summer's were my favorite because of all the memories! Have you ever thought about doing ISR swim lessons? We've done them with all 3 of our kids. They've never had to wear floaties-it is actually discouraged because it creates a false sense of security. You can start the lessons at 6 months old but we waited until age 1 or 2. None of mine ever needed swim lessons again, it's a one time thing and they will be able to save themselves if they fall in the pool or any water by floating on their back to breathe and rest and then swimming to the side or stairs. It's truly amazing and so worth the money and the peace of mind it gives! Just wanted to share in case you are interested for Bowen. Have a great summer! I'm counting down the days to pool days. I just wished we lived closer to y'all so we could join you!! I loved this post! I've got a 2.5 year old and a 7m old and I'm slightly freaking out about the pool this summer. Thankfully I've got a sweet high schooler girl who is going to help me when she is able to. I need to remmeber to be less rigid with nap. I've always been such a nap nazi! So. Many. Things. BUT SWEET BABY NIXON. That boy almost gave me a heart attack on more than one occasion. I felt like I needed to buy a red one piece and get one of those flotation devices to carry around so I could look authentic if I ever needed to jump into Baywatch mode with him. #pamelaanderson And I totally remember moving baby B on that chair to get him to the shade. Love all of our memories together at the pool! This post is perfect timing! I finally got used to two kiddos at the pool by myself... and now there is sweet JJ. I'm a bit nervous about the pool with 3 babies this summer, but that's not stopping us. Bring on summer and the pool!! How come you go to a pool rather than use the one at your house? I live in the Midwest where community pools aren't really a thing so I'm curious! Thanks! I've never heard of it! Thanks so much for sharing! You should drive over sometimes!! Letting that baby nap at the pool could help!! Good luck to you, Mama! Hahahahaha!!!! I would have died if you would have shown up at the pool dressed as a lifeguard. Hilarious!!! But we were all playing "lifeguard" with him at the pool!! Great question-when my kids were younger we didn't have a pool at our house and neither did any of my friends. We all met up to swim. Now several of us have pools and we do swim at homes some but it's nice when no one has to "get ready" for people coming over. Also-our kids are getting bigger and if our whole group was over our backyard pools would feel really tiny. It's also nice to change up the scenery so that's why we tend to go to a big pool. Great suggestions!! 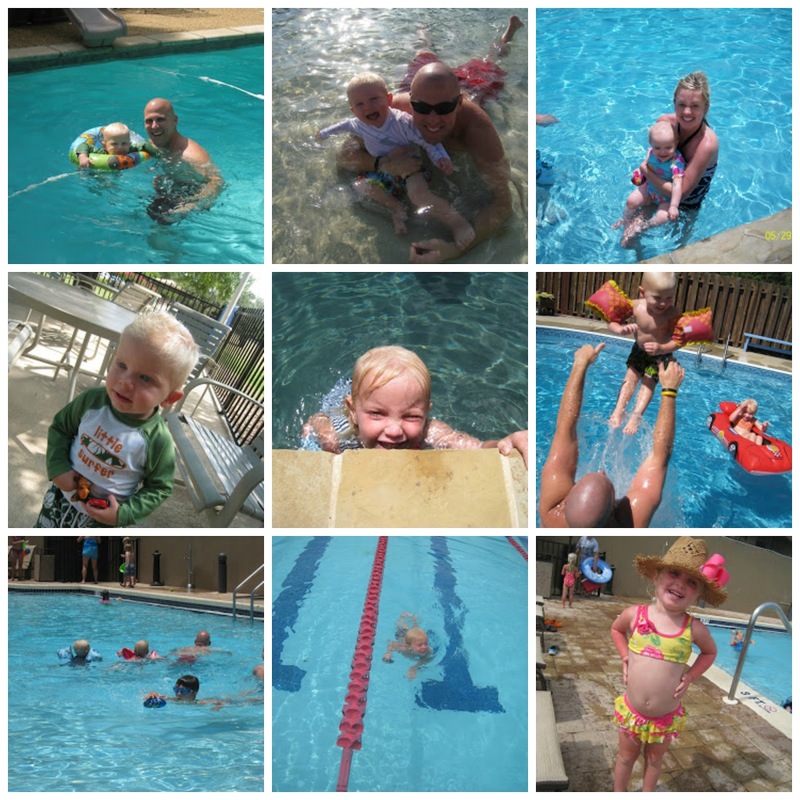 I wish we had more pool time - my kids swim for hours and then crash HARD after swimming!! 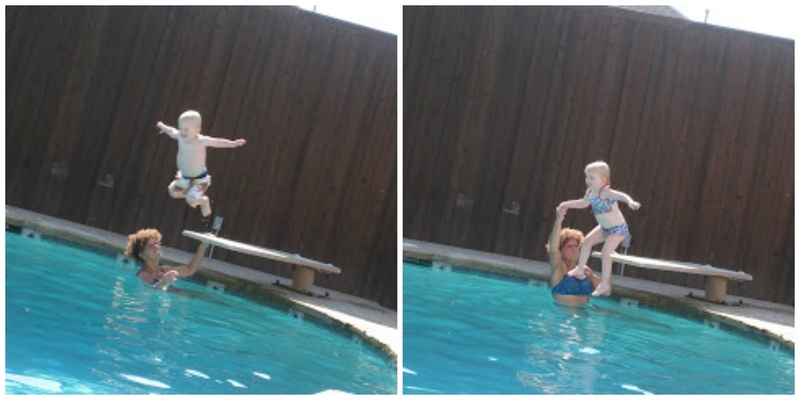 Having a child not afraid of the water is scary. My daughter has no fear of any water and it is scary. I feel you! I had to have one eye on that kid at all times. Great post! Looking forward to more "How Erika Does" posts. I was blessed with three EARLY swimmers - all less than two and a half, they just got the hang of it and never took a lesson, BUT, I still panic with having a backyard pool, especially since it's right outside their bedroom windows and their playroom door connects to it, eek. I think, though, that I'll still watch them like a hawk when they're teenagers, haha. You can't go ten feet in florida without hitting water SOMEWHERE. And you are right - my kids are 7, 5, and 2, and puddle jumpers were not a thing 7 years ago! You are super woman!!!! I need to find tiny Fisher a life jacket soon!! He is way too small for a puddle jumper. I remember meeting yall at the pool 9 months pregnant and barely being able to keep up with 1 and you had 3. See super woman!! I might need to come visit this summer and enjoy a pool day!!! What great memories with your kids! I am so excited for summer to start up around here so we can get back to the pool! Love the "How Erika does.." Great tips for Summer pool fun! 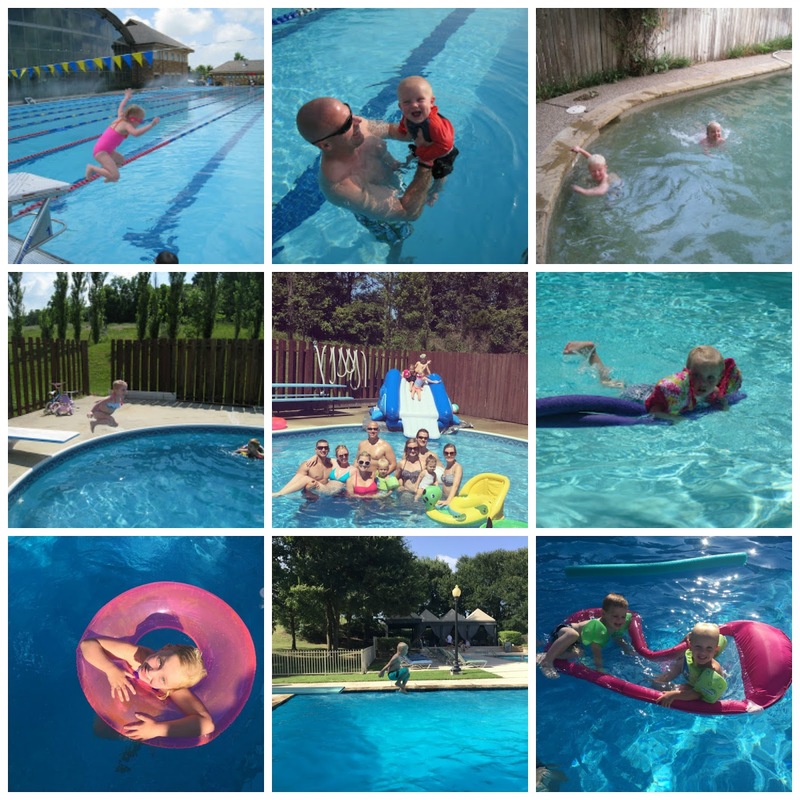 I LIVED for pool days in the Summer when I was younger and love to create those days for my kids now! With 4 ive learned to sunscreen them up about 30 min before we leave (or before friends arrive to swim at our house) while they watch a short show--that way when the fun arrives or we arrive it's GO TIME. My youngest says that the wait for sunscreen to dry is the 'longest minutes of his wifeeee' 😂. Think of how many other things were gonna say "they didn't have that when we were young" about. Hahaha! Fisher might need one of those super cool life jacket suits. Hahaha! I have no doubt you can handle those boys at the pool. I'd LOVE a pool day with the Butlers! Me too, Jen! We were ready and today it's cool outside. Ugh! You're too funny!! It's so scary-I agree. We need to go to the pool with you guys this summer! My kids are so fair skinned. We have to reapply sunscreen all the time! !